Taking a walk through Atlanta reveals the sight of new businesses, apartments and historical sites. Among those buildings are ones that are neglected and abandoned, some of which are owned by Georgia State. One of those buildings is the historic Bell Building on 25 Auburn Ave. 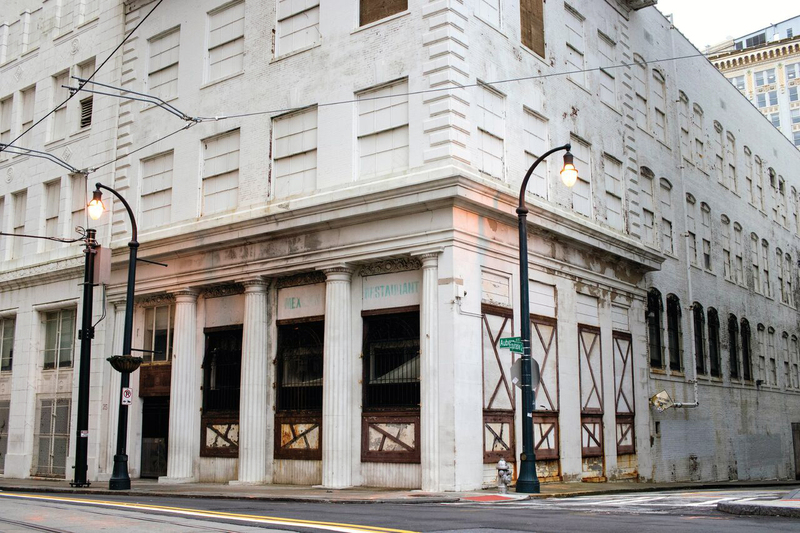 The building was originally part of a series of building projects that took place in 2015 that were funded by the Woodruff Foundation, a private foundation that often financially supports projects and parties around Atlanta. In 2014, Georgia State drafted plans to request money for the funding of the Cube Initiative, a creative media project that constructed various film-oriented facilities, as well as the Bell Building. The Woodruff Foundation alloted $22.7 million. The Woodruff Foundation agreed to give Georgia State $3.5 million on top of that for the Cube, but held back the money after the university decided against the demolition of the Bell Building following a public backlash in the form of a petition. The funds would cover the complete cost of the demolition and also would allow the university to implement a parking lot that would aid in reducing the risk of overcrowding at Georgia State’s many parking decks. But the petition, which has now garnered over 2,500 signatures, called for the university to preserve the building. So the Bell Building continued to sit idly as it has since 2006. A representative of Historic Atlanta, who wished to remain anonymous, said that the building is definitely able to be restored. He said that, as time goes on, the building’s roof is deteriorating, allowing more water inside resulting in more damage to the structure of the building. He said that, eventually, Georgia State would have no option but to demolish the building. “We would really be happy if [Georgia State] chose to appropriately stabilize the buildings, which would [include putting] on a roof and [ensuring] that other stabilization measures like boarding up windows and other things are done more appropriately. Obviously, right now there is clearly visible broken class and garbage, and it just looks like a mess. So that’s a temporary solution,” the anonymous source said. Vice President of Facilities at Georgia State Ramesh Vakamudi said that the estimate for restoring the building would be close to $30 million. This number was acquired after Georgia State teamed up with the Lord Aeck Sargent design firm. The representative from Historic Atlanta said that, though the cost is justified, he still wishes that Georgia State will allocate funding to preserve the buildings. He said that it appears that Georgia State is intentionally allowing the buildings to deteriorate until they are unsalvageable. Activists took action on Valentine’s Day 2018 to voice their concerns about the building and others like it. The National Trust for Historic Preservation placed hearts on several of the historical buildings near the Downtown campus that urged officials to re-use the buildings instead of letting them sit idly or be demolished. “Heart bombing,” as the practice is known, has been around since the 1990s. “I’ve only seen preservation as a tool for social justice and activism, and it doesn’t take much to get involved. I think it’s a matter of talking to people on campus and around campus about the places that matter to you. I think heartbombing is a good tool because it’s kinda this visual and positive proclamation,” said a marketing department representative for the National Trust for Historic Preservation. According to the representative, the heart bombs have been successful in the past in causing members of city councils and other governing bodies to make changes in the preservation of these historical buildings. One of the several buildings that was heart bombed, besides the Bell Building, was the Atlanta Life Insurance Co. next to Georgia State’s Centennial Hall. The building has been abandoned for several years and is adjacent to a gravel parking lot. Carson Prince, a senior at Georgia State, said he wanted to see the building turn into a facility focusing on art and creativity. Another student expressed that she would rather have the building be demolished and a park installed in its place exclusive to Georgia State students. Ebonee Douté said that currently students do not have a place to go to. According to Curbed, Georgia State has announced that Kell Hall will be demolished to create a green space within Library Plaza, but that plan is still a few years away from completion. I would love to talk to the Author. I was one of the students that “heart bombed” the buildings. Our university has a masters program that focuses on historic preservation and public history. It is called the Masters in Heritage Preservation Program. I am happy to speak with the author about preservation on campus and how more students can be involved in preserving downtown’s historic buildings and preservation activism.